A small world in itself, a pond of water contains many marvellous things. The sunlight glistens off the surface of the water, obscuring what lies beneath to a casual glance. 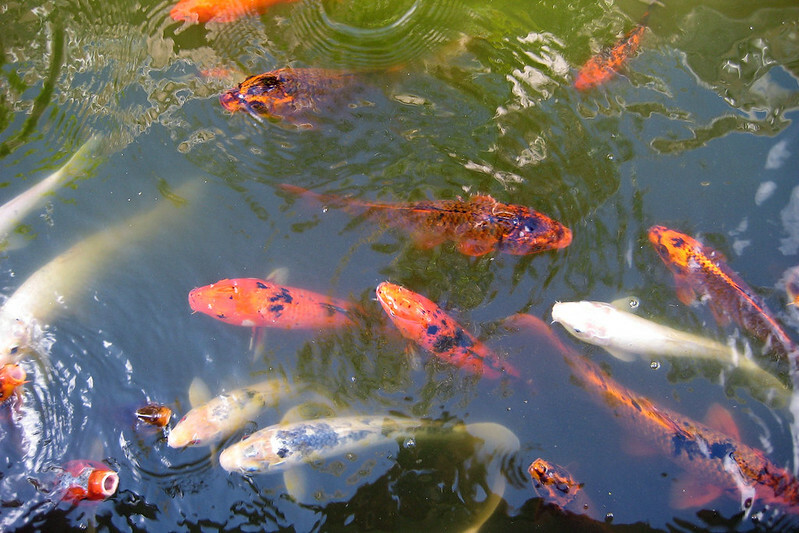 Small ripples may begin as an insect or a frog breaks the surface, or a bubble rises from a fish or tortoise. They are damped down by the rushes and reeds which grow around the periphery. A lazy buzz fills the air as a dragonfly scoots to and fro, searching for prey. A leaf falls from an overhanging tree, landing on the clear glass of the pond, bringing to mind the Escher lithograph of the Three Worlds of the surface, the fish underneath, and the reflection of the tree branches above. Given a pond, a child's sense of wonder and fun can fill an entire day. Catching tadpoles, skipping stones, swinging above the water and letting oneself drop into the cool relief from the summer heat. Perhaps throwing a line in and sitting on the bank, pretending to care about the fish but really just soaking in the feeling of being outside and being a part of the world. There is a lot of life in a pond. There are algae and pondweeds, and water lilies. There are bladderworts, which capture nematode worms with planty lassos, holding and constricting the luckless worms to death so they can serve as food for the plant. There are mosquito larvae, which graze on algae and bacteria before pupating into their bloodsucking adult forms. 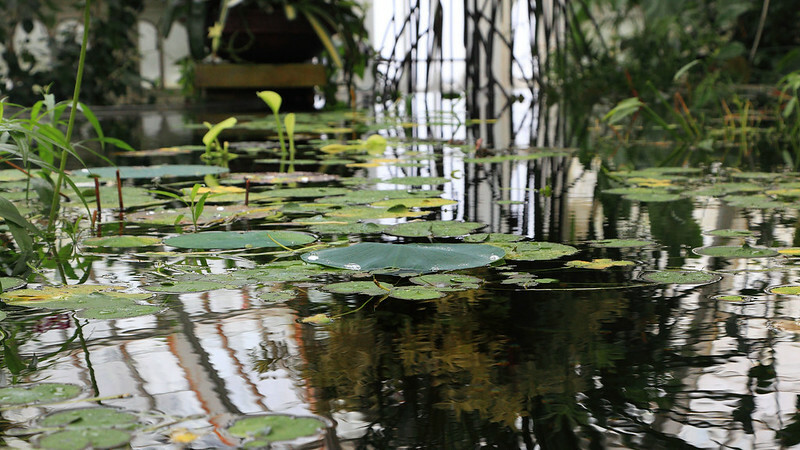 Water lilies and other pond plants. Some species of spiders live or spend time under the water, preying on insects or even small fish. Spiders are air breathers, and need to take an air supply with them. At their small scale, the surface tension of water and the interaction of hairs on their bodies allows them to take a filmy bubble of air with them whenever they dive. Some keep a store of air in a bubble hidden under a ledge. Other small creatures also make use of the surface tension of pond water, resting lightly on the surface without sinking in. Water striders skate across the water, creating nothing more than shallow dimples in the surface with their legs. Other insects, the backswimmers, hang upside down underneath the surface layer of the pond. Whereas water striders are delicate insects, backswimmers are carnivores and will attack and eat tadpoles and small fish. And like the spiders, there are insects who plunge deep into the water, carrying a small supply of air with them, seeking food and shelter in the depths. Water strider. Creative Commons Attribution-Share Alike image, by Flickr user dolorix. Frogs, able to move across land, can make their way to many isolated ponds that fish cannot reach. Their moist skins require water, lest they dry out, but a frog can travel a fair distance between watering holes. Their presence is betrayed by tadpoles in the water, and the croaking calls of the parents. Frogs are mostly heard rather than seen as they are well camouflaged. Occasionally a plink of water will indicate where one has just jumped. Pond in Japanese garden, with several tortoises (centre). More visible is a tortoise, sunning itself on a flat rock by the water. With its waterproof reptilian skin and hard shell, it presents a far more difficult target for any swooping bird than a soft-bodied frog. It too may have wandered far across the land seeking a watery place to lurk and find food. And indeed birds and other animals who do not live in the pond are also attracted to it, both as a place to obtain a drink and a place to find a meal. Where there is water, there is life, after all. Around the pond grow reeds and rushes, and then trees, also finding the nearness of water inviting. Often a small clump of trees will mark the place when seen from a distance. The whole picture is one which creates something that humans find attractive and appealing. 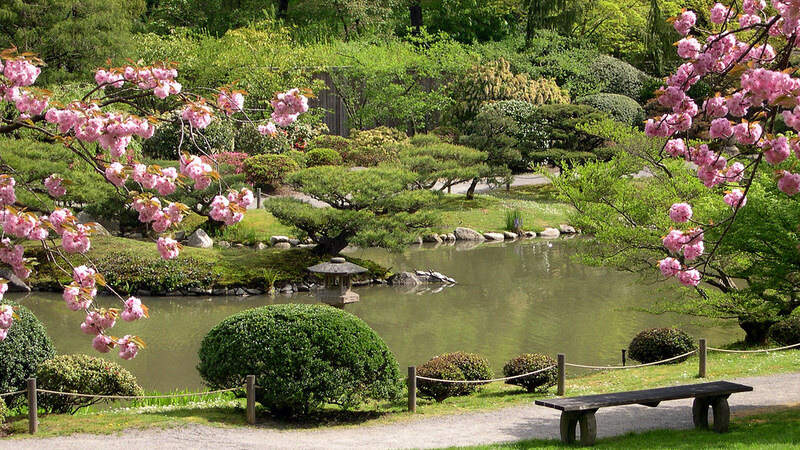 The pond features strongly in gardens around the world, as a place of tranquility and providing an aesthetic sense of harmony with nature. Claude Monet famously spent the latter years of his life painting numerous scenes of the ponds in his gardens at Giverny. 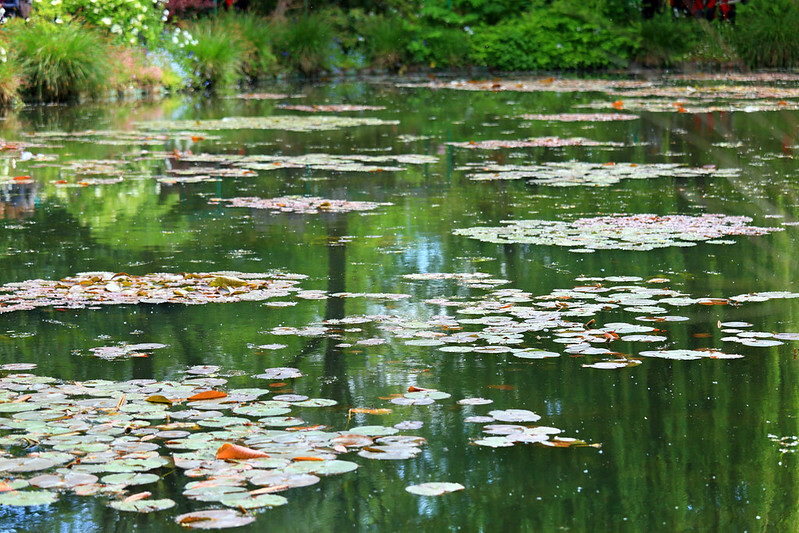 Monet's garden pond at Giverny. 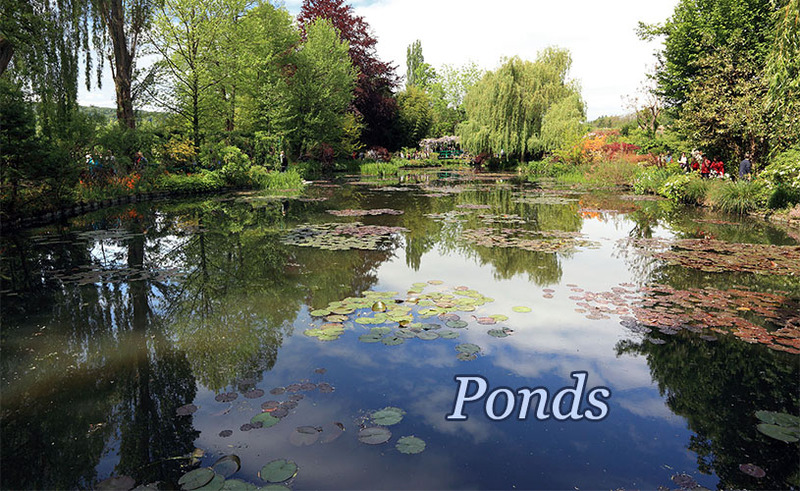 So a pond is a piece of nature, self-contained, beautiful, and allowing us to marvel at the wonders of the natural world in comfort, while evoking the peaceful restfulness of lazy summer days. No wonder we like them so much. 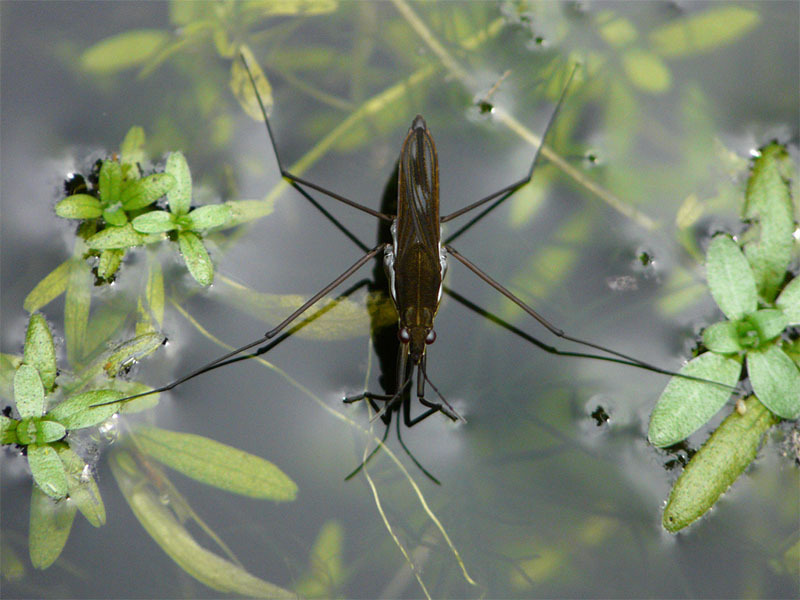 Remarkably, water striders are not restricted to fresh water. Some species, known as sea striders, (Halobates) live in marine environments, and a few actually live on the surface of the open ocean, far from land. This is a place colonised by no other members of the otherwise ubiquitous insect family. These ocean going insects skim the salt water surface much like their pond brethren, somehow finding enough to eat and laying their eggs on bits of flotsam such as cuttlefish bones and, nowadays, scraps of floating garbage produced by humans. I use what is, apparently, just the Australian definition of a "tortoise" here. In my dialect of English, the conventional distinction drawn between tortoises and turtles is that tortoises have feet, and spend their lives on land and/or in fresh water, whereas turtles have flippers and are solely ocean-going animals, coming ashore only to lay eggs (what other dialects of English distinguish specifically as "sea turtles"). It seems that usage in both British and American English differs. There are only seven species of sea turtles: the leatherback sea turtle, green sea turtle, loggerhead sea turtle, Kemp's ridley sea turtle, hawksbill sea turtle, flatback sea turtle, and olive ridley sea turtle. So to me, as an Australian, these are the only species described as turtles, and every other shelled reptile is a tortoise. In particular, Leonardo, Donatello, Raphael, and Michelangelo are Teenage Mutant Ninja Tortoises. I don't know how this local language distinction from British and American English arose, but it's interesting. Last Modified: Tuesday, 17 February 2015; 02:50:44 PST.